There are many different people that want to know what’s the difference between ice cream and frozen yogurt. The big problem is that there are many ads that tend to distort our perception of these two popular deserts. What you should always remember is the fact that even if there are similarities between the two, there are also differences that you have to understand. Frozen yogurt is basically made with yogurt and not cream. This automatically makes it a lot healthier than ice cream and this is the reason why so many people consider it. It’s also important to note that frozen yogurt is richer in a lot of minerals and nutrients when compared to ice cream but it can be unhealthy as well especially since it’s not like the yogurt from before. Yogurt is fermented and it is created by simply adding some bacterial cultures to the used milk. The bacteria help the milk to ferment and this releases lactic acid. The acid will make milk proteins thicker and the result is the mass that we see in yogurt. You can only consider yogurt as being as it should when live bacteria will remain after it is created. This is because the culture will enter your body when you consume yogurt and this will help in many other bodily functions. 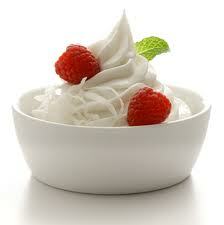 You should look at frozen yogurt as simply being healthier than ice cream and less healthy than real yogurt. It does contain protein but it is only a third of what you find in regular yogurt. Ice cream has a lot more fat and frozen yogurt usually has less. However, this does vary from one shop to the other. The fat free frozen yogurt sometimes includes more sugar so this is something that you want to be careful about. What’s The Difference Between Ice Cream And Frozen Yogurt Manufacturing? Making ice cream is similar to making frozen yogurt. Almost the same ingredients are utilized but yogurt will replace cream content. Sugar is added and this is why experts think that this option is not that healthy when compared with regular yogurt. The yogurt utilized will melt and freeze at higher/lower temperatures when compared with ice cream. We can say that the main difference between the two is just the use of yogurt instead of cream. This does automatically mean that we are looking at a much healthier product when compared with ice cream and it is a really good idea to consume it since the taste is similar. Some people even love the taste of frozen yogurt more. However, if you are mostly interested in getting a really healthy product, you might want to look for frozen yogurt that is created without the addition of sugar. There are substances that are safe but in most cases, sugar is utilized because it is cheap and really easy to find. Always look at the ingredients in order to make the best decision possible. Next post: Where Can You Buy Frozen Yogurt Mix?